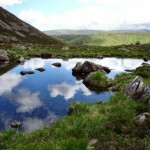 Another fantastic day in the hills – cycle in to Derry Lodge. 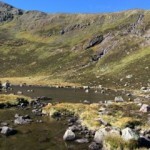 Run up Glen Derry to Lochan Uaine (east), then contour round through boulder field and down to Hutchison Mem Hut (would have been better descending sooner to the path). 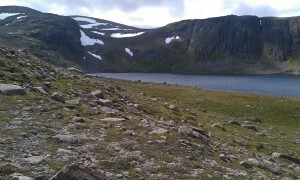 Then onwards up to Loch Etchechan which had white horses on it from the breeze coming down off the tops. 29k total, with 10k on the bike in/out. This entry was posted in cp12, cp13 and tagged Warren on October 12, 2015 by site_admin. This entry was posted in cp12 and tagged Duncan on September 30, 2015 by site_admin. 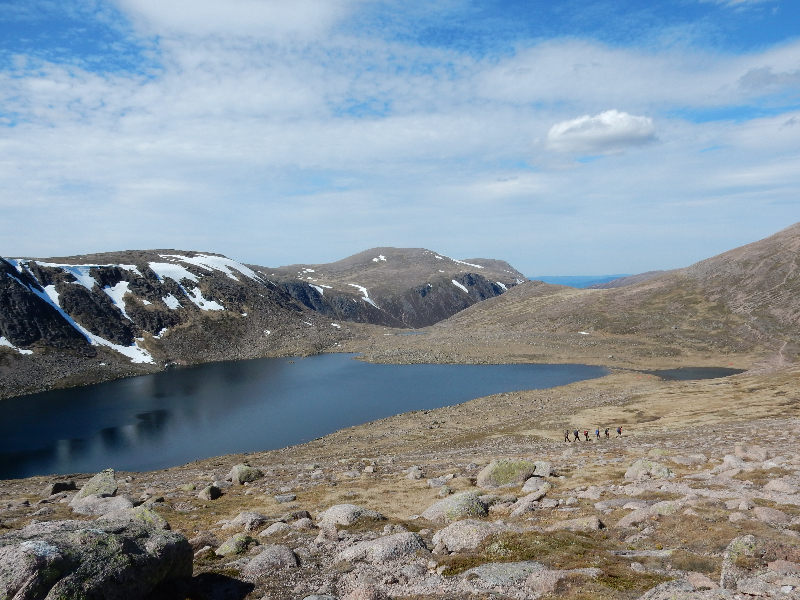 03/07/15Finally a good day in the Cairngorms was promised by the forecasters. Cycled in from Linn of Dee past Derry Lodge and a few km further up Glen Derry. 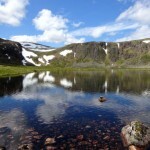 Climbed first up to Lochan Uaine (cp12) in the corrie to the east of Derry Cairngorm. Then on to the summit, where I met Andy T and Roger C also making the most of a fine day. 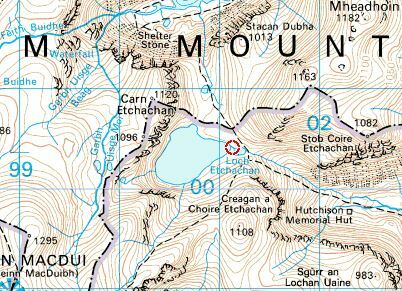 From there there was some nice running across and down to Loch Etchachan (cp13) before a good workout up the climb to Ben Mheadhoin and more nice running along the top to the high point on the tor. From the top I dropped diagonally down to the Larig Lui and back along the path to the bike. A great day in the hills. This entry was posted in cp12, cp13 and tagged SarahD on July 27, 2015 by site_admin. 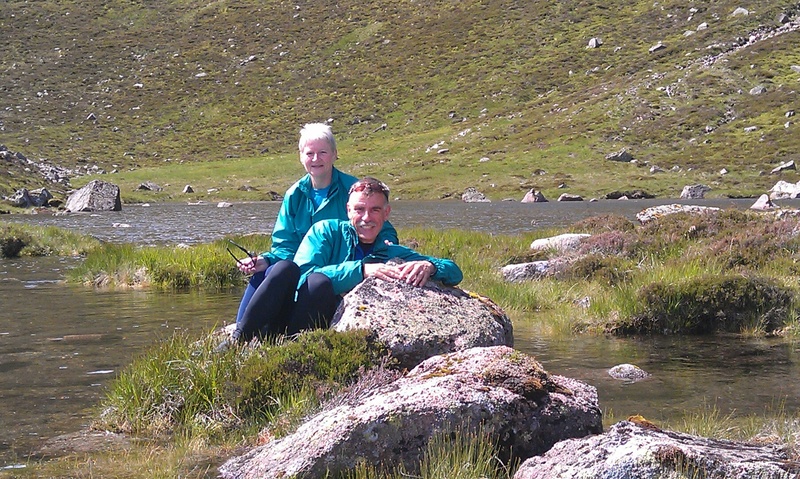 Taking advantage of a “scattered showers forecast” we set off to visit the three water points around Derry Cairngorm. Parked bikes at Derry lodge and off on foot up Glen Derry until we came abreast of cp13. With so much rain recently, the burn was quite full and we gave up attempting a dry crossing and just waded across knee deep. 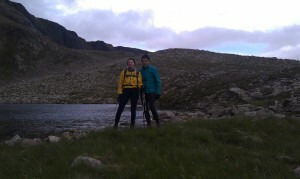 Stiff climb up to the lovely lochan. Didn’t want to retrace our watery steps back down to the track so contoured around (bouldery) until we could drop down to the Hutchison Hut. Quick energy gel and on up the track to Etchachan. 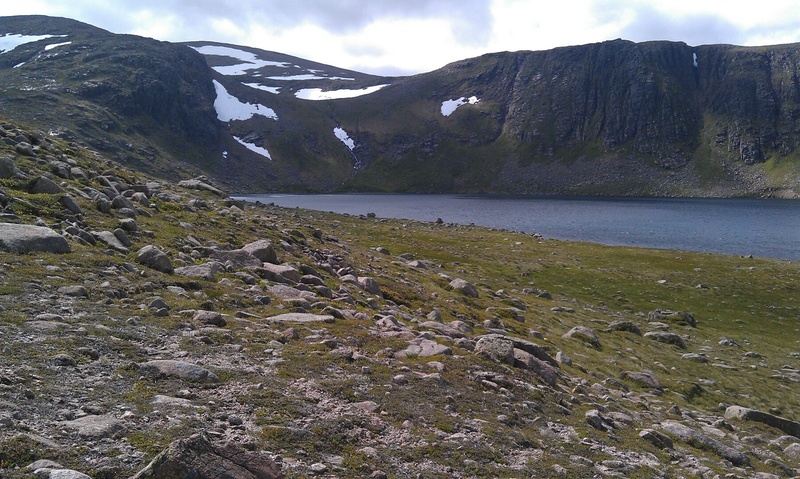 Very windy and exposed at the top so we didn’t stop but carried on up the south westerly track which eventually leads to Ben Macdui. Planned to turn off this track and head down into Glen Lui the but got a bit mesmerised with the good track vs boulders and stuck on track too long. After a bit of re-orientation we got sorted out and found our way way down to the head of the stream at NO009995. Very bouldery ground again as we headed down and then up to our third cp. From here there is still a long way to go to get out and with the ground very wet we were slipping about and getting very tired. Eventually passed Luibeg bridge on our right and back to our bikes for the easy pedal back to the car. This entry was posted in cp12, cp13, cp9 and tagged D&E on July 22, 2015 by site_admin. 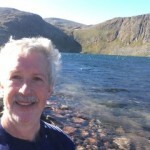 Bike to Derry Lodge then walk / run over Derry Cairngorm and down to cp12 at Loch Etchachan before heading up Beinn Mheadoin. Then back to Derry Lodge via Glen Derry. 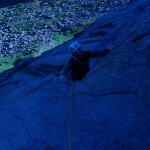 With Andy T but met Sarah D on both summits. 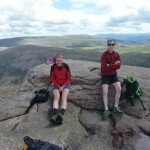 Fabulous Cairngorm day. Interesting side story. Met a Dane out running near Etchachan. Met him again on the track back out from Derry Lodge later on. By that time he’d been out for a very impressive 50km from Badaguish and over some very significant tops. He was heading to Linn of Dee to look for a lift back to Aviemore. We took him to the road junction near Ballater. Hope he made it home! This entry was posted in cp12 and tagged RogerC on July 3, 2015 by site_admin. This entry was posted in cp12 and tagged Duncan on June 12, 2015 by site_admin. Got a call from an old friend soon to be leaving the 60’s behind re going out for day as the forecast was good. 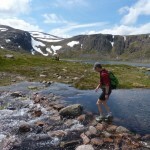 I had bumped into him On Lochnagar In Feb, but seems since then he has struggled to get out into the hills. This was not going to be a big ticking day though optimism meant that despite having 1 sac between us rock boots were included. Plan wa sto try and get 3 ticks but the start was not good as we both caused delays aso when start eventually happened it was not early. We biked up to the far woods in Glen Derry, pleased to say bridge at Derry Lodge is up and open though not used, where the bikes were dropped. The river was crossed with feet staying dry, just, and pleasant ground was covered up to the eastern Lochan Uaine which is a truely fine spot. The waterfall above it looks like a fine winter project, assuming it flows enough to freeze. From there we headed west up hill avoiding the snow and the small cliffs to reach Little Cairngorm ( a fine name for a checkpoint!!!) were alas a decission had to be made, Chigong started at 7 and must say the team was making steady progress. so Lochain Uaine and climbing On Grey man’s crag had to bed shelved until the snow has cleared as even the loch was still half iced so Derry Cairngorm was ascended. No sign of anybody near summit and great views showing significant Snow cover fo checkpoints 5 to 9. The coll to the west of Creagan a’Choire Etchachan was climbed and the snow easily avoided in the climb up to Loch Etchahan which was a popular campsight. 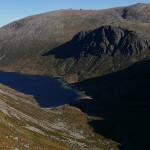 From the Loch the track was followed to the Hutchison hut an dback to the bikes. Despite best efforts was only back in time for the Tai Chi class at 8. A fine day and hopefully will find a way to get pics on. This entry was posted in cp12, cp13 and tagged Duncan on June 11, 2015 by site_admin.